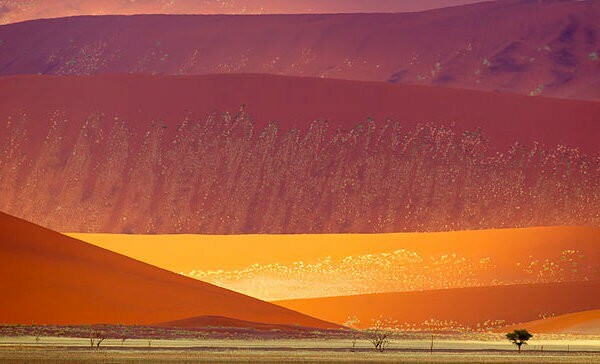 Located within the Namib-Naukluft National Park, the Sossusvlei is packed with tall sand dunes, geological attractions and scenic landscapes. It is a sensational photographic gem and you’ll find it about 5 hours’ drive form your Windhoek accommodation and 400 km from Swakopmund. Along with Etosha National Park, it is one of Namibia’s most visited locations. Sesriem Canyon with its water pools lingering six-leather-straps-length beneath the intricate rock formations on the way down. The Dunes, namely Dune 45 and Big Daddy. These are great for climbing and provide panoramic views over the sands from their lofty heights. Take plenty of water and leave early in the morning to avoid the midday heat. A camera is essential. The Sossusvlei itself at the Tsachaub River is one of the world’s most photographed sites. See the famous fossilised camel thorn trees with their feet in the salty white clay of Dead vlei. Hunt for animal tracks like the Namib Gecko or sand snakes on the barren surface of Hiddenvlei. Take note of the solid rock faces of the Petrified Dunes which are visible as you travel around the area. You can explore this picturesque terrain on foot, by quad bike and 4×4, or in a hot air balloon soaring on the currents above. A guided tour is a must if you want to find out more about the area, it’s history and inhabitants as you go along. Most of the species found in this hyper-arid area are supremely adapted to survive here and very often unique to the area. Vegetation has learned to glean nourishment from the Atlantic coastal fog which is typical around these parts. Camel thorn trees and deep-rooted Nara melons are the most prolific plant forms found here. Fascinating and ancient Welwitschia plants abound in the northern reaches of the Namib-Naukluft. Toktokkie beetles, Namib Dune ants, cartwheeling spiders, Namib geckos and gemsbok are some of the other desert adapted creatures you may come across during your travels. If you stay out after dark, you could come across bat-eared foxes, jackals and porcupines as they emerge from their daytime retreats. Birdwatchers can look forward to sightings of Rueppell’s Bustard, Monteiro’s Hornbill, Dune Lark, Black-eared Sparrow-Lark, Kopje Warbler, and Karoo Thrush. For more information on the activities and attractions surrounding the Sossusvlei check out the Namibia Travel Guide. Your great Namibian adventure starts when you book your flights and accommodation in Windhoek. Start planning today.